Bring balance to your wardrobe with this energetic beaded necklace. 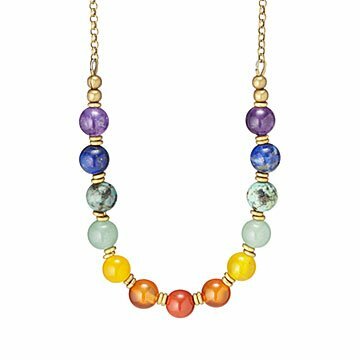 Said to target your body's energy centers, the seven chakras are represented in this energizing necklace by a rainbow of gemstones paired with brass beads made by women in Kenya. Layer it with your other favorites for a unique look, or wear it alone as a standout statement piece. Handmade by Carolina Elias in California. Make it a set! Click here to see the matching Chakra Gemstone Earrings and Chakra Gemstone Bracelet. Carolina Elias started making jewelry in 2006, when she became a mother and saw a need for comfortable, casual jewelry. This inspired her to create her jewelry line of yoga, nature, urban fashion inspired jewelry. When she became a Reiki therapist in 2011, she started focusing on the benefits of gemstones, and of creating jewelry with a purpose, it is now a favorite by the active lifestyle community, becoming the preferred jewelry for athletes, yogis, and inspired individuals. Her focus has always been on the wear-ability of the pieces she creates, on using natural materials that are comfortable and that carry natural properties. Her mission is to make the wearer happy when wearing the jewelry she creates. Remove before showering, do not expose to excessive moisture and/or sweat. I receive a lot of compliments when wearing my necklace. I just wished it was water/sweat resistant so I could wear it all the time and never have to take it off. Bead colors and chain are dull looking. Wish the bead meaning came with the necklace rather than having to copy it off of the website. Just wasn't what I expected for a $75+ gift (including shipping price), but the bead meaning will be of interest for my friend. I would not order this again and would not encourage anyone to buy it without looking elsewhere first. This was a big hit, an "I can use this for so many..." kind of item.